International travel security awareness may improve aviation security. Malaysia Airlines Flight 17: IMG’s thoughts on air travel safety and security. On July 17th, 2014 Malaysia Airlines Flight 17 was en-route to Kuala Lumpur from Amsterdam when it crashed in eastern Ukraine. All of the 298 people aboard the flight were killed after the aircraft was shot down by a surface-to-air missile. Although no one has claimed responsibility, US intelligence believes that pro-Russian separatists in eastern Ukraine are responsible for the downing of the aircraft. This tragedy follows months of fighting between Ukraine’s pro-Western government and pro-Russian separatists in the country’s east. In fact, several Ukrainian aircraft have been shot down in the past few months including a transport plane carrying 49 Ukrainian troops. Many Western observers believe that Moscow is arming the separatists with increasingly sophisticated weapons, including advanced anti-aircraft missiles thereby threatening aviation security. Some also believe that Russian Special Forces may be advising the Ukrainian rebels. In fact, just before the Malaysia Airlines tragedy, President Barack Obama pushed for further sanctions against Moscow for failing to halt the flow of weapons to the separatists. A New International Travel Security Threat? Many observers are questioning why a passenger aircraft was allowed to fly over a known conflict zone in the first place. Eastern Ukraine has experienced heated fighting for the past few months, and separatists have already shot down several Ukrainian aircraft. However, flying over conflict zones is a common practice for many international air carriers. For example, many airlines continued to fly over Iraq and Afghanistan at the heights of these conflicts. However, in these instances, aviation security authorities felt that high altitude flights were safe due to the limitations of insurgent anti-aircraft weapons. Increasingly, weaponry in the hands of terrorist groups is now posing more of a threat to international travel safety. Yet, aviation security authorities did have concerns about the conflict in Ukraine. On the day of the tragedy, there was a no-fly zone over eastern Ukraine. However, it was capped at 32,000 feet, meaning aircraft could still fly so long as they remained above this altitude. It is probable that officials believed that aircraft flying at these heights would be safe from more common, but less capable, anti-aircraft systems. However, what officials failed to take into account was that both sides in the Ukrainian conflict had access to advanced anti-aircraft systems capable of hitting aircraft flying above 32,000 feet. This has resulted in a change in international travel safety awareness and a new approach to aviation safety. Some airlines, such as British Airways, chose to avoid flying over the conflict zone in Ukraine. Many other airlines did not divert flights. After all, the area above 32,000 feet was deemed clear by Eurocontrol, a European Air Safety Organization, and diverting flights away from the area would prove costly. 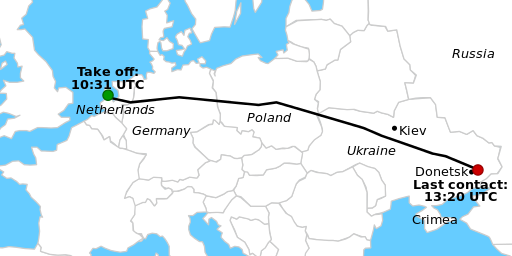 In fact, the flight path over eastern Ukraine is known as airway L980, a popular conduit between European and Asian hubs. It is no surprise then, that many airlines were reluctant to change their routes. When it comes to aviation security, there is no central authoritative organization. Although the UN’s ICAO is recognized worldwide, its powers are limited. As a result, regional or national bodies generally determine if a no-fly restriction is necessary or not. Yet, airlines still have quite a bit of latitude. While some areas such as Syria, North Korea, and Somalia are almost universally avoided, airlines often make their own decisions on flight paths. As a result, air carriers should take steps to increase security awareness and monitor the security environment of the areas they fly over and take mitigation efforts when appropriate. Unfortunately, the tragedy of Malaysian Airlines Flight 17 is not unique. Aviation safety and security has long been an issue over conflict zones and there have been several instances of passenger planes being shot down over conflict zones. For example, Iran Air flight 655 was shot down over the Persian Gulf by the USS Vincennes in 1988 and Libyan Airlines Flight 114 was shot down by Israel over the Sinai Peninsula several months before the 1973 October War. The unfortunate fact is that militaries occasionally mistake passenger planes for military aircraft. This risk is most dangerous during a conflict or over a contested area, as belligerents may not have the time or the resources to confirm the identity of aircraft. As a result, airlines should remain cognizant of the international security climate and understand the potential anti-aircraft threats in the areas they fly.